“You alright?” he asked, steadying me as the last of the nausea faded. Anger flared. No, I wasn’t all right. I was a freaking faery who couldn’t use glamour! Not without fainting, throwing up, or getting so dizzy I was practically useless. I was allergic to myself! How pathetic was that? I was recently turned on to this awesome series by some fellow book bloggers. I read the first two books and novella back to back and anxiously awaited to get my hands on this latest book. I have to say that I was not disappointed because I easily finished it in one day. All 362 pages! The book is full of action, unlikely alliances, and some heartbreaking scenes that disrupted the HEA that I was so sure would happen. 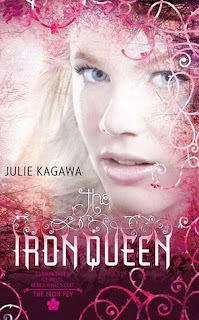 Iron Queen continues with the Iron Fey wrecking havoc in Nevernever making the dysfunctional Summer and Winter courts hell bent on sacrificing Meghan to save their own necks. Meghan isn’t the same girl, which is a good thing because she finally tells King Oberon and Queen Mab where to stick it. She is still learning, but I felt like she made better choices and handled things a little bit better this time. She realizes her destiny and accepts her place. Puck continues to annoy the hell out of me. To be honest, the Three Musketeer act could easily be a twosome and I would love it. I know that Puck is put in the story as sort of a comic relief to lighten the dark mode that this book takes on, but I found myself skipping over his parts and not caring what I missed. Yes, I am a Puck hater. Ash is the man. From the time he was introduced to the story, I knew he would end up with Meghan. He was a prick at first, but his love and devotion to Meghan is what draws me to the series. Now this is a love story, rated PG, but still a great love story. It’s tragic that destiny keeps pulling them apart, but in the end I know the HEA will be worth the frustration of having to wait. Overall, the story was easy to follow, the characters were good, and the plot was even better than the last. If you are a fae fan and haven’t gotten around to reading this series, you are missing out on some good reading. Book two is also a fav for me, but I love Ash even more in this book.